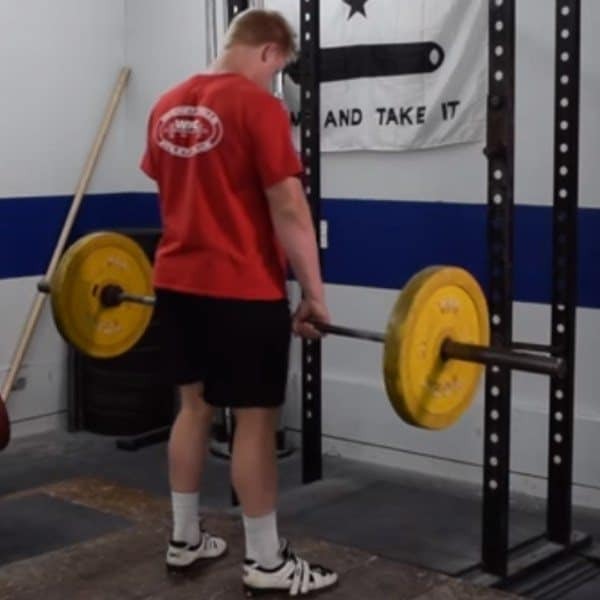 Is the Romanian Deadlift Right for You? Setup the loaded barbell on the floor in front of you. 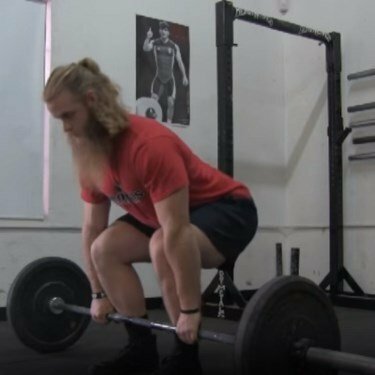 Position your hands, feet and body exactly like you would on a conventional deadlift. Then perform a conventional deadlift rep until your are standing up straight. Then deadlift the weight up until you lockout. This is the RDL starting position. Source: same as previous. Set the bar on the j-hooks at about mid-thigh level. Set the safety spotter bars at just below the bottom of the range of motion. 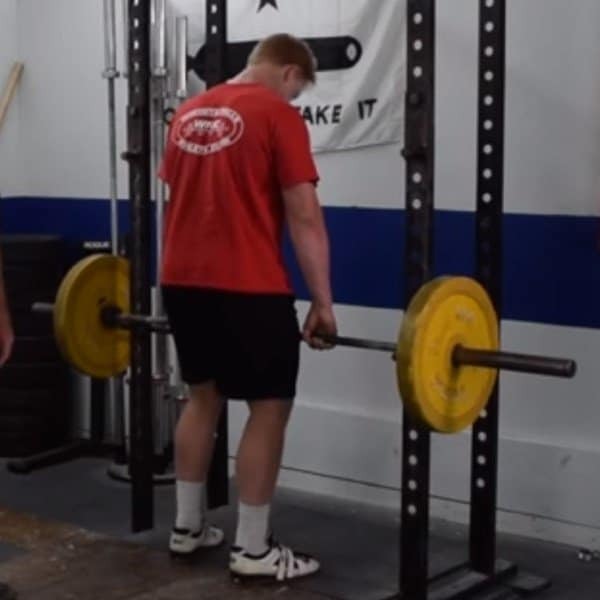 Set feet in a power position before pulling the bar off the j-hooks. Keeping a tight, rigid posture while actively bracing the core, hinge your hips to reach your hands to the bar. 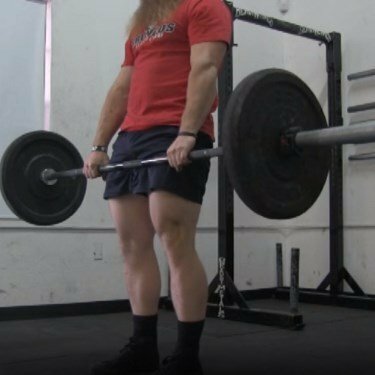 Set the hands in the same position you use during conventional deadlifts (i.e. approx. shoulder width, with hands just outside of knees). Increase lat involvement by pulling the shoulder blades down and together. 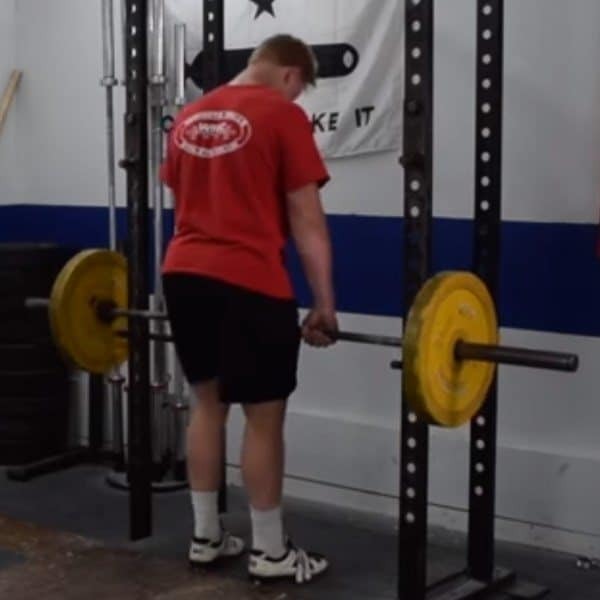 Your rigid, braced, and hinged position should line your shoulder blades up directly over the bar. 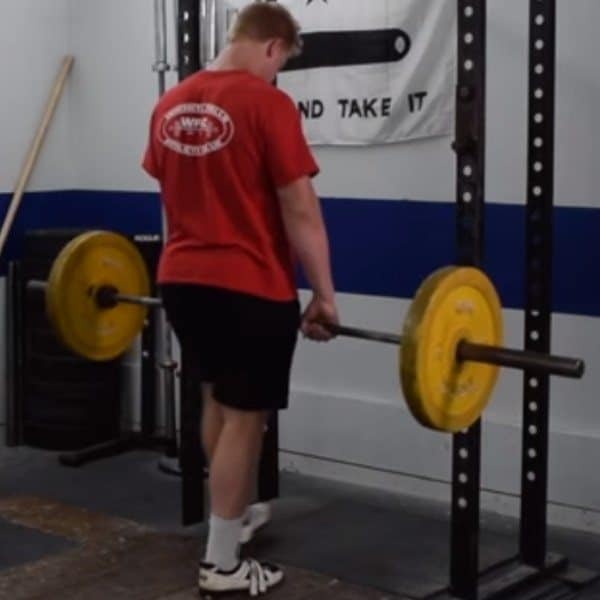 Unrack the bar from the j-hooks by extending your knees and hips until standing straight up. Hoist the bar off the pins. Stay tight. 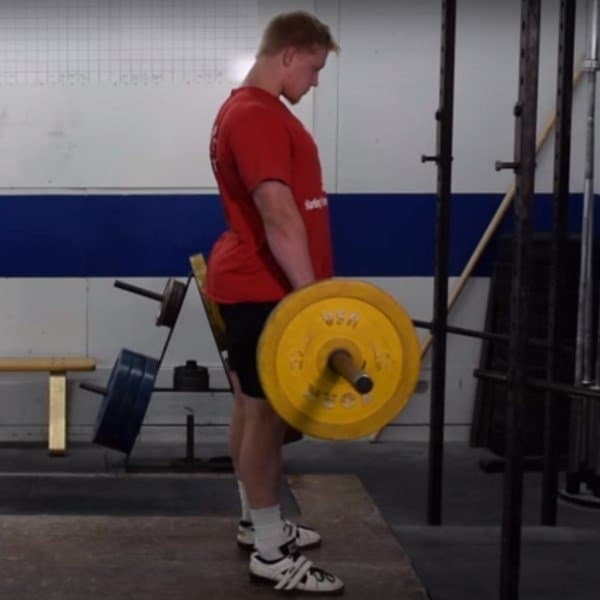 Walk the bar out by carefully taking one step back with your non-dominant foot, and then stepping back with your dominant foot so that your feet are aligned and in the conventional deadlift stance (i.e. approx hip width apart). Carefully take a step back, away from the pins. Step back with the other foot. Adjust feet/stance as needed until you're in a comfortable and powerful stance. Ensure that the bar has completely settled and is motionless and you are standing straight with the bar touching your thighs. Be sure there is enough distance between you and the rack to do the exercise. This is your starting position. You should look like this just before initiating the RDL movement. Lower the bar with an unyielding posture to somewhere between just below the knees to mid shin. Activate the lats and the mid back by keeping the bar in contact with the legs throughout the lift. Explosively push the hips forward and drive hard through the heels to return to the erect standing position. This is the bottom of the range of motion. You may end up being slightly higher or slightly lower than shown in this image, depending on your limb and torso lengths/ratios, and your mobility (or lack thereof). Continue holding a rigid, neutral posture, ensuring the head, shoulders, hips, knees, and ankles are all aligned. You can pause for up to 1 second to emphasize the stretch on your glutes and hamstrings. Driving the hips forward explosively until standing fully upright. This is the peak of the concentric rep, and the end of the RDL range of motion. This marks the completion of one rep. Note that this ending position is the same as the starting position shown above; you can transition straight into another rep from this position if needed. Be sure you have complete control over the bar and global extension/alignment of all joints has been achieved before beginning the next rep. If you started from the floor, lower the bar to floor like you would with a deadlift. This is usually a two fold problem. 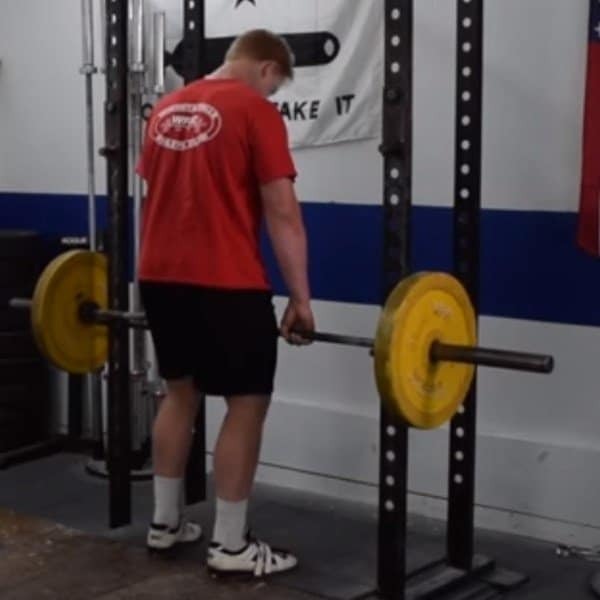 The combination of too much weight on the bar and a weak core cause the spine to be compromised. If you notice rounding, drop the weight until you can maintain good posture and actively work on core strength. Bring the bar down right before the point you feel rounding in the lower back/upper back. This will ensure consistent bar position in the bottom of the hip hinge. The extreme angle of the hips hinging back can cause the bar to drift forward. Focus on actively pulling the bar back into your body at your shoulder (like a straight arm pulldown in a cable machine). Focus on driving the hips back and keeping your weight distribution over your heels. You can have a soft bend in your knees but your hips shouldn’t “squat” down. Once the bar is reversed, focus on explosively extending the hips forward and driving through the back/middle of your feet. If you have consistent issues here, you need to drop the weight to something you can complete. Always make sure you completely warm-up. RDLs are a very eccentric muscle action focused exercise. Don’t forget to BRACE. Take a big deep breath before each rep, pull it as deep into your stomach as you can, and hold it as tight as you can. This is commonly referred to as the Valsalva Maneuver and helps ensure neutral/rigid lower back. This is key for lower back safety during a rack pull. Learn to hip hinge. The goal of the movement is a powerful hip extension. In order to achieve that, the hips must be kept high and back during the eccentric portion of the left. If you’re having trouble keeping your spine in a neutral position, practice hip hinging with a PVC pipe or broomstick. 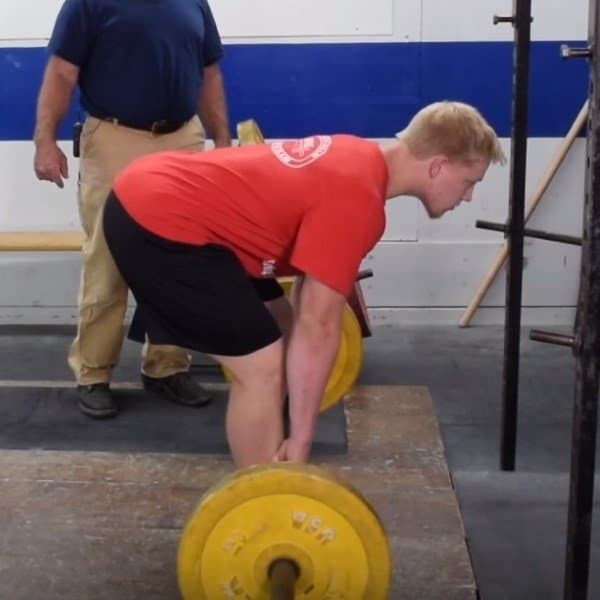 Basically, you want to hold a broomstick behind your back while you do an “air deadlift.” The goal is to keep your upper hips, upper back, and head in contact with the PVC throughout the movement. To ensure maximal and optimal hip drive, imagine you’re “driving your heels through the floor." During both the concentric and the eccentric phases of the lift, the hips and shoulder should be moving at the same time. Disjointed movement of either means there is weakness in your ability to hinge or in your postural control. Actively squeeze your glutes when locking out the weight to make sure your hips are completely extended. Allowing the bar to drift forward markedly increases the difficulty of the lift and increases the risk of you losing your postural position. Make a conscious effort to keep the bar in contact with the legs during all phases of the lift. The goal of the movement is to exaggerate your hinge to maximally involve the hamstrings and glutes. You’ll know you’ve hinged well when you feel a huge hamstring stretch once the bar passes your knees. In order to get maximal hamstring activation, make sure you’re wearing a shoe with a flat hard sole that allows unrestricted movement of your ankles. Straps should definitely be used if your grip begins failing. This exercise is being used to strengthen your hamstring, glutes, and lower back. It should not turn into max effort grip work. Some lifters like to use an alternate grip (one hand supinated, one hand pronated) in order to hold more weight in their hands during RDLs. This hand position can cause structural imbalances in the arms, shoulders, upper back and lower back if the hands are not “flip flopped” often enough. Make sure you are working both sides equally. Getting stronger with RDLs will help you lift more weight in literally every single lower body exercise. But, keep in mind to start very conservative on the weight being used and take a long time to make slow and steady progress. 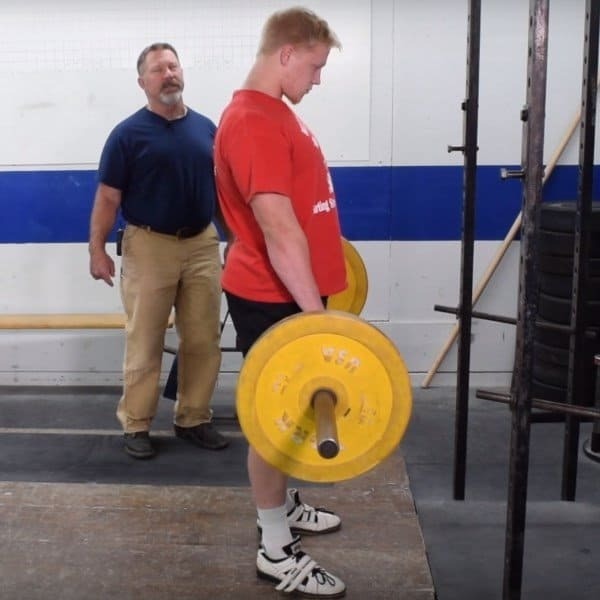 If you are doing the lift correctly, there is a lot of eccentric (mechanical muscle lengthening due to the force of gravity on the body and the weight) stress than can really tear you up if you try to do too much too soon. Slow progress now will pay dividends later on. RDLs should be a foundational lift in absolutely every strength training program. They are phenomenal for strengthening the hips, hamstrings and lower back. They are also an ideal exercise for anyone dealing with postural issues with other compound barbell lifts.